(full size, downloadable, map(s) on upcoming pages). In this course, there are 6 lessons. Dynamic Emergence explained: Experiential Truths. 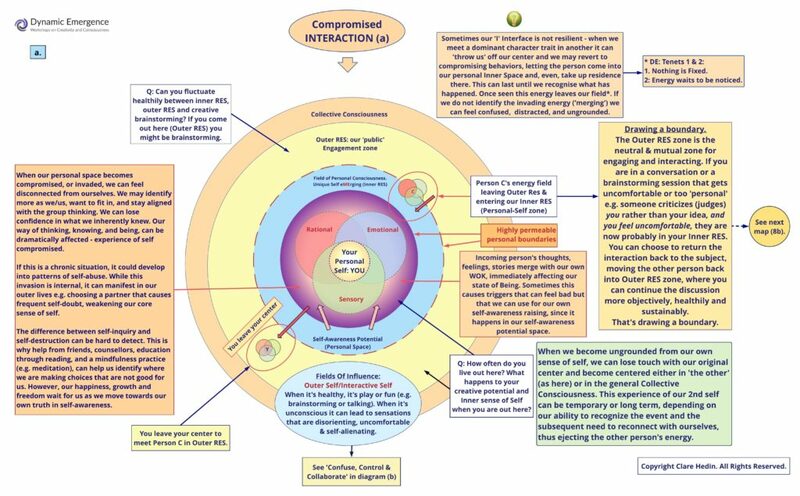 Dynamic Emergence explained: The components. 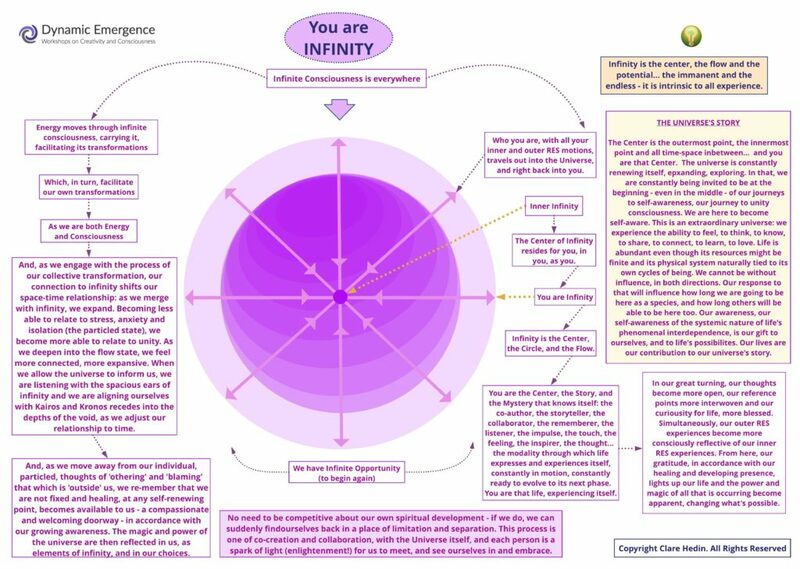 Dynamic Emergence explained: Living Systems review. 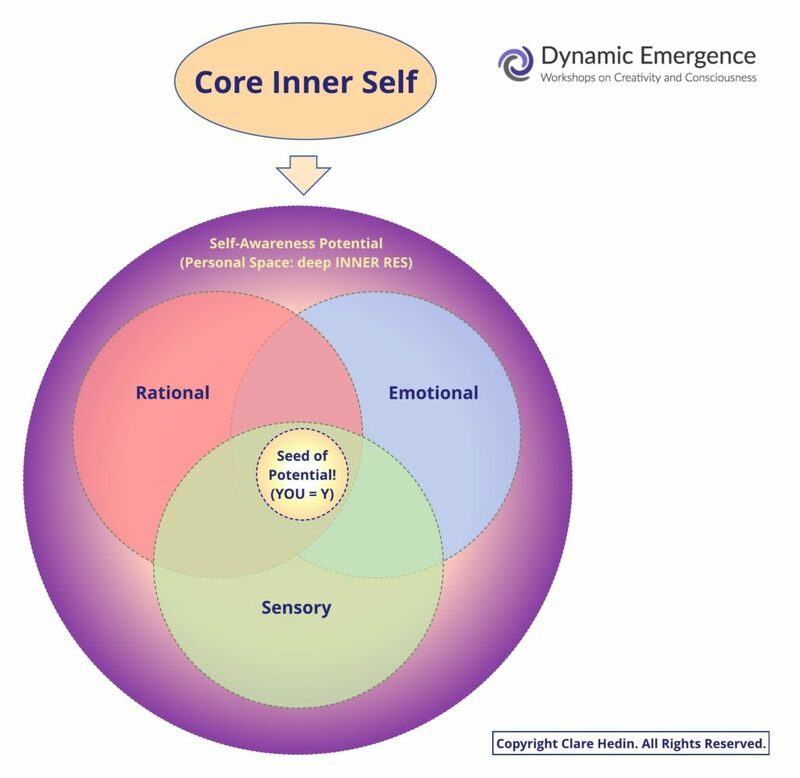 Dynamic Emergence explained: How to Thrive! Dynamic Emergence explained: Review & Example. Each lesson contains 6 elements. A ‘welcome image’ to invite contemplation, invitational paragraph & quote. 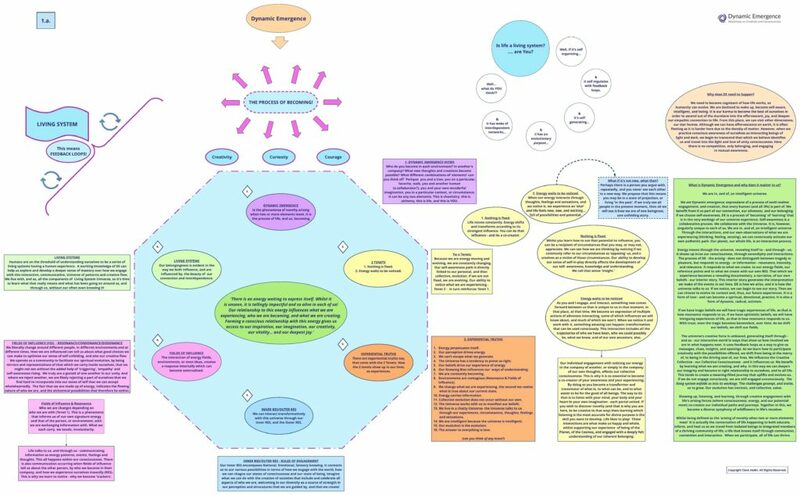 Mindmap of the video presentation. 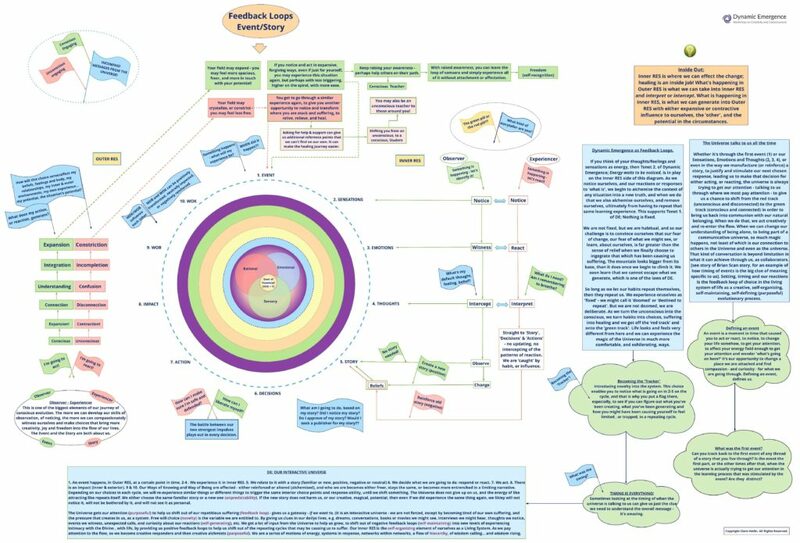 *[Print mindmap for easier contemplation – recommended minimum size 11″x17″]. A self-reflective review (self-reflection questions) to help you make this relevant and personal to your growth, research, and learning. They can be responded to in a personal journal and also shared in the Forum. Incorporate your learning into a personally devised creative process and/or professional application! Visit the dedicated Forum at any time during the course to share, and discuss, what you are experiencing, and learning. The group will Zoom video conference weekly, with Clare, to discuss the content, ask questions and share insights and discoveries. The ability to hear each other live, as well as communicate on the Forum, enables deeper peer learning. Questions to ask yourself in each lesson: ‘What new skills of awareness would I like to develop? Where might I want to apply them? How might I adjust how I approach events, people, and my own ideas and experiences, to reach my personal goals? Below are the course lessons – go through each lesson, before moving on to the next. 6. DE: Living systems. 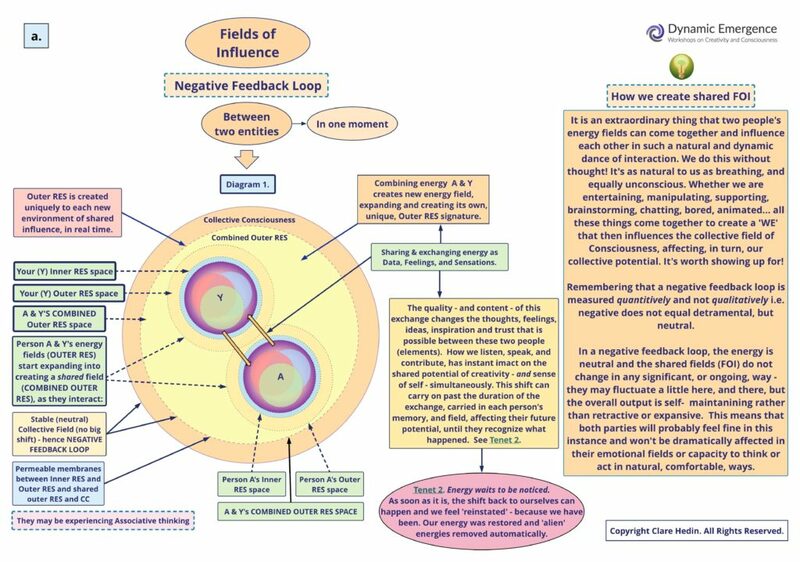 Feedback loops, Karmic time and our interactive Universe. In this course, there are 7 lessons. 7. DE: Who are we? What are we? Where are we? Cosmological being & inter-realmic reality. In this course, there are 3 lessons. Cosmological YOU (who are you in the greater scheme of things? Inter-realmic properties (what is each realm providing?). Inner Infinity (as within, so it is without – we are everywhere, part of everything). Qualities of RES – aspects, skills and approaches. WOK choices, being thinking creating. Incoming – opening the portals to awareness. 4. DE: Vulnerability & Susceptibility – identifying cultural and pre-cognitive influences. Indigenous YOU vs. Coloniser YOU. 3. DE: Fields of Influence & Theory of Resonance. (full size, downloadable, map(s) on upcoming pages. How your energy interacts with one person. How your energy interacts with a group of people. How we create belief systems. Inner RES emphasis (knowing bias) – connected. Inner RES emphasis (knowing bias) – disconnected. 2. DE Foundations – RES at our core. In this course, there are 5 lessons. You exist as proof of magic! You emerge into the World (and interact!). 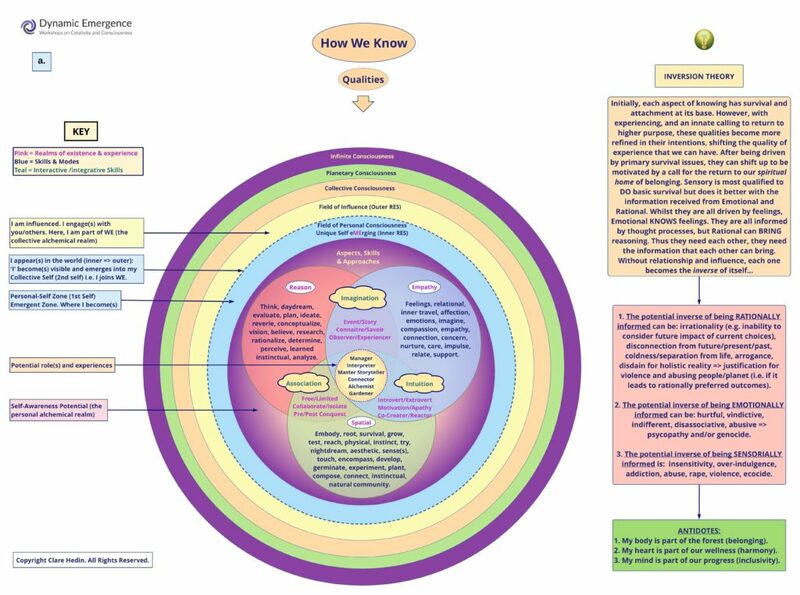 RES overview with focus on Rational knowing. Emotional knowing, and its gifts. Sensory knowing as a unique awareness.